Google (s GOOG) distributed some 5,000 Samsung Galaxy 10.1 Tablets to attendees of the sold-out Google I/O 2011 developer conference Tuesday in San Francisco, and GigaOM was in the house to get an early look at the hardware. 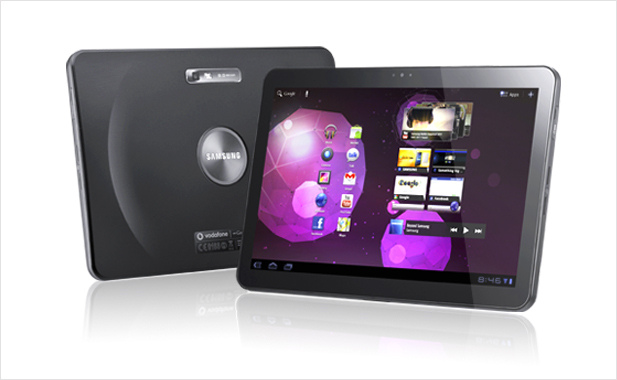 The Galaxy Tab 10.1 runs Honeycomb, the latest version of the Google Android mobile operating system. As my colleague Kevin Tofel reported in February, the device is named after its 10.1 inch screen, and comes in 16GB or 32GB versions. Powered by a dual-core Nvidia Tegra 2 processor, the device offers display resolution of 1280×800 pixels, 1080p video recording and playback, an 8 megapixel rear camera with an LED flash, and a 2 megapixel front camera. It is rumored that the Tab’s pricing will start at $399 before taxes, but Samsung has not officially confirmed where it will be available or for how much. 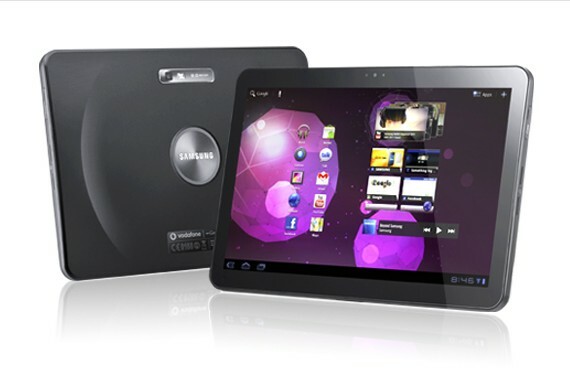 If you also received a Galaxy Tab 10.1 at I/O, we’d love to hear your reactions in the comments. I still don’t get why people think honeycomb is a good UI. It’s certainly not ‘discoverable’ in any way shape or form. Every time I’ve seen a video of a user working it for the first time like this, their hand movements are full of obvious hesitations and pauses. Unlike Collleen here, the person demoing it usually says a lot of things like “Uh, … wait… um …” etc. I won’t even mention how even though the whole device is an odd size due to the emphasis on video playback, that the 1080p video she played still had letterboxing, and the 1080p video she recorded was still 4:3. Oh wait, I did mention it didn’t I? You don’t “get” honeycomb, or any other OS that doesn’t start with an “i” for that matter, because you have never used Android. Every OS with even a sliver of power and capability will have a learning curve. Opening apps on android is easy as pie and any common functions are equally simple. It’s all the extra stuff that no other tablet can even come close to that perhaps confounds you. If you want the android tablets to be as dumb and simplistic as ios then you can leave it at that and just use the app drawer. If you want it to do more, it’s going to take some learnin’. Mac os, windows, and linux all have little things you need to learn to get around – but that’s because they are flexible. You can adjust them to meet your needs – some more than others. If you can’t handle the flexibility of Android, I feel sorry for you, but you can simply not use the more advanced features or stick with the ipad. Whatever you do, don’t bash a product with an incredible amount of increased capability for not having a ‘discoverable’ ui. Open the apps drawer. Done. That’s all you need to discover if you’re going for ipad simplicity. If you want something more complex like widgets, interactive desktop interfaces, customizable layouts and homescreens – well, that’s more complex, and there’s no way around that. Btw, the device is actually a normal size. Do you use a 4:3 tv? How about a 4:3 computer monitor? So why have a 4:3 non-hd tablet? The Galaxy Tab 10.1 is 16:9 – the standard. The ipad is an odd size. I wish fanboys would come right out and identify themselves at the beginning of their posts. That way people would know not to take their comments seriously. Btw, I’m not an android or apple fanboy. I strongly considered both ipad, xoom, and galaxy and I leaned ipad until samsung redesigned the 10.1 to be better in every way. It’s lighter, thinner, has a bigger higher res screen, both cameras are better than the others, and it comes with the flexibility of android. I can’t wait to get one. Peobody’s comment is accurate. Honeycomb is a confused UI. Here’s an example: why are there at least 3 different ways for an App to present settings? Why are THE MOST used buttons on the left bottom side of the screen? If users are going â€œUh, â€¦ waitâ€¦ um â€¦â€ then there IS a problem – and some usability studies would demonstrate and identify those. Your blind defense of Honeycomb ignores the fact that it’s got some real issues. dr3d, what studies? My comment offers facts and reason. How ironic that yours that is so blind! Show some facts or at least make an actual argument. Studies “would” demonstrate? Alright, let’s see it! If you don’t have anything valuable to say, don’t post! Also avoid telling the obvious and try to be more specific. For example: “It’s lightweight, but not super lightweight” still can mean anything. Thanks for the input, M. I’m definitely not a gadget expert, so you’re right– I was a bit nervous. Hopefully I will get better at these with time! Please prepare your next upcoming video’s by practicing somewhat more on presenting your stuff. You’ll be less nervous :). Also try to be more specific. For example: “it’s lightweight, but not super lightweight.” doesn’t make it a lot clearer to people. Can anyone tell me how many hours of battery life the Galaxy Tab has when running video? Tip for ya. In the browser location bar type about:debug and hit enter. Nothing will appear to happen. Then open the settings for the browser and you’ll see a Debug option where you can set the User Agent to “Desktop” and thus will get the full version of GigaOm (and other sites) rather than the mobile version. Unfortunately this setting doesn’t seem to ‘stick’ and you’ll have to re-do it fairly often.